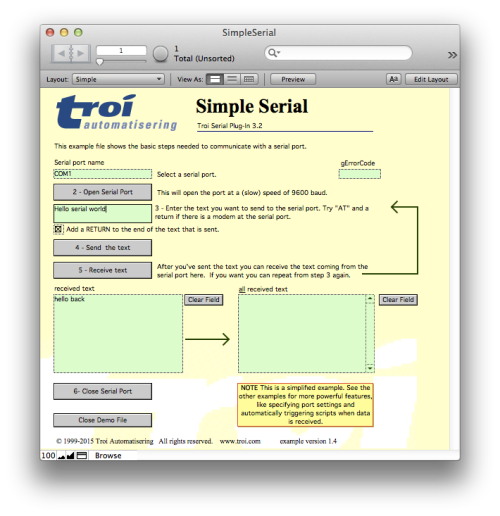 Troi Serial Plug-in buffers the incoming data. With every call to Serial_Receive all data from the buffer is retrieved. This might not be all data coming in. You might need to wait and append new data coming in at a later time. This will open the COM1 port. When data comes in, the script “Process Data Received for COM1” in the current filename will be triggered. If you open more serial ports you can specify a different script for each port. In the triggered script you can then use the Serial_Receive function to read the data. Of course you can do much more in the script, like for example send reply data back with the Serial_Send function. It is a great and easy way to enhance your FileMaker database for you or your customers.